Ladies and gentlemen because you deserve it, the splendid Left Bank exclusively inviting you all, and for the first time to experience a night of glamour and networking at their majestic VIP cocktail bar. 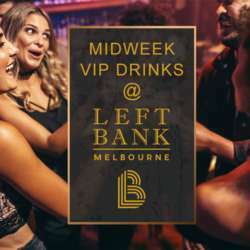 If you are thinking twice about signing in and attending, this is the event to be, Left Bank Melbourne is proud of its 9 years of continuous service on South Bank. It is Melbourne's most famous restaurant & cocktail bar. It's the place where people of all sorts come to meet at least once in their life. Positioned on Melbourne's Yarra river with extraordinary views of the city's impressive skyline. Located a short stroll down Southbank promenade from the art center or Southgate. For all the newbies, Left Bank has recently refurbished, the new-look space is all-out Melbourne glam, soft lighting, a sun-lit promenade space, and high-end finishes in tones of copper and gold, and a bar with charcoal lounges and a mirrored ceiling. Keep an eye out for the brand new custom roof-sculpture from local artist Corey Thomas. We're turning left and never looking back, please bring your beautiful self and anyone else you know, and come to experience a chilled night at the stylish Left Bank.